The fact that a number of state governments are unable to pay salary in Nigeria for many months is no longer a news. What is amazing about this is the fact that these same states are located in different parts of the country that have huge mineral deposits which can be mined and processed for export. The state governments do not seem to understand where and how to generate huge revenue in this sector. They are busy arguing that the constitution should be amended to give them control so that the revenue like royalties from the sector can come to them. These royalties are just about 3-5% of the value of the products being mined which in my opinion is just a meagre amount when compared to what the state governments can benefit in terms of revenue from this sector. Some other states have started collecting fees (which is a few hundreds of thousands of Naira) from miners based on the minerals mined and shipped out of the state. All these are just shortcuts to revenue generation in this sector and these are nothing when compared to the potential revenues that states governments can derive from this sector. Since this article is primarily focused on exportation of solid minerals, I will like to highlight some of the minerals that are in high demand in the export markets and the states where they can be found in Nigeria ( I will like to also say that this list is really not exhaustive). These include: Lead & Zinc (Cross River, Ebonyi, FCT, Plateau, and Zamfara), Tin (Cross River, Kano, Kwara, Nassarawa and Plateau), Mica (Ekiti, Kogi, Kwara, Nassarawa, Ogun, Osun and Oyo), Manganese (Kenny, Zamfara and Katsina), Rutile (Plateau, Bauchi, Cross River and Kaduna), Wolframite (Baluchi, Kaduna, Kano, Niger, Nassarawa and Zamfara), Gemstones (Bauchi, Kaduna, Kwara, Nassarawa,Niger, Oyo and Plateau) Tantalite (Cross River, Ekiti, Kogi and Kwara), Columbite (Bauchi, Cross River, Kaduna, Niger, Nassarawa and Plateau), Lithium (Nassarawa, Niger and Zamfara), Gold (FCT, Kaduna, Katsina, Kebbi, Kwara, Niger, Osun and Zamfara). Others include Silver, Iron and Coal to mention a few. The aim of this article is to show the Nigerian state governments in practical terms, where the income is in this sector and how they can develop an enduring structure to perceptually generate revenue from this sector. The model to be proposed in this writeup is not just a theory but a practical model that we are already using and current working in the Nigerian business environment. This model is called the 3T Impex MRG Model for federal and state governments. 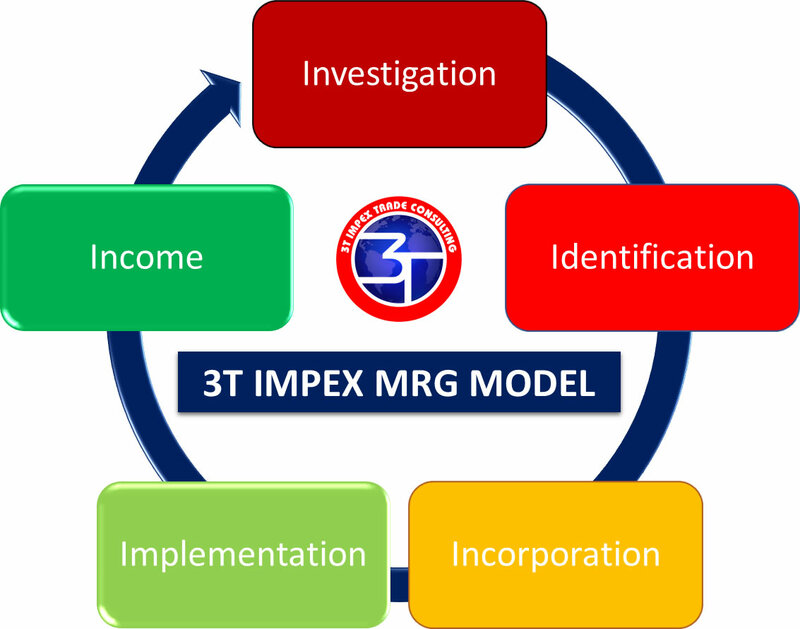 The MRG Model is a Mineral Revenue Generation Model for governments and it involves five phases which include: Investigations, Identification, Incorporation, Implementation and Income. The Investigation phase of the MRG Model include searching for the various minerals in the states, confirm their exact locations, cadastral units and spreads, the estimated deposits and the proven deposits, uses of these minerals, what is required to process them into the secondary state, their market demands etc. Most of these preliminary information can be obtained from federal government ministry, departments and agencies in charge of solid minerals. Some of them can also be obtained from consultants in the industry. All these information are necessary before proceeding to the next phase. Upon conclusion of all the Investigations, then the state governments can begin the second phase of the MRG Model which is Identification. This involves using the information obtained during the search done at the investigation stage to narrow down the options of the minerals to explore and take an informed decision on which one to start with. The mineral being chosen at this stage should be the one that is not just available in large quantity in the state, but also have huge potential for export. This phase should also include identification of the owner of the mining site (if it has already been allocated), a local administrative partner and foreign technical partner that will work with the government on the project. Upon identification of the mineral to explore, export market with huge demand, credible local partner and competent foreign partner, we can them move to the next phase of the model. The third and critical phase of MRG Model is the Incorporation. The government needs to register a special purpose vehicle which must be a limited liability company in which the government, mining site owner, local administrative partner and foreign technical partner are all shareholders. In this alliance, the mining site owner should be given a share of about 10-20% of the income generated by the company based on his investments in securing and possibly exploring the mining site. The local administrative partner should be a consultant in the industry and should be the one to supervise the site activities, manage the business, source for local labour force, and possibly source for the foreign technical partner and should therefore be allotted a share of about 5-10% of the income of the company. The foreign technical partner is the one that will provide the machinery, equipment, take care of the cost of maintaining and managing the equipment, get the buyers abroad and competent personnel that will do the actual mining activities and should therefore be given about 30-40% of the income generated by the company. The state governments should be responsible for providing the title to the land for mining, feeding and accommodation for the workers, road infrastructure to the mining site, development of the community where the mining activities take place, warehouse for products and equipment, security for the personnel and products from the mine and should therefore be given 40-45% of the income generated by the company. All these should be documented in a shareholder agreement and joint venture agreement to be signed by all the parties. The fourth phase of the MRG Model is the Implementation. This involves the actual business operations like building of infrastructure, warehouse and staff accommodation, arrival of the foreign partners, movement of personnel and equipment to site, provisions of security, signing of agreement with the community, mining activities, sorting, processing (if necessary), bagging, transport of the goods to the port and port logistics. The fifth and the last phase of the MRG Model is the Income. This include the signing of purchase agreement with the buyer, opening of the export proceed account, pre and post export documentations, quality inspection, shipment and payment of export proceeds from abroad. The revenue sharing formula proposed at the Incorporation phase is just a suggestion based on our experience but the adoption or adjustment are subject to the parties involved. At this point, I will like to paint a picture that compares the Income of the MRG Model to that which is expected from just royalty or fees charge per truck load. Take for example a mine that produced 10,000MT of lead ore of 60% purity over a period of 12 months. The goods were transported to the port from the mine using about 333 Truckloads because each of the trucks is having a capacity of 30MT each. The local market price is N350,000/MT while the export price is $850/MT FOB Lagos. If the state charges a fee of N500,000 per truck (this price is much higher than what they currently charge), the state will only make an income of about N166Million from this mine. On the other hand, if the federal government charged a royalty of 5% (which is highest rate ) based on the local market price, it will only realise an income of about N175Million and if they shared this equally with the states (which is currently not the case), the state will only get about N87.5Million. However, with the 3T Impex MRG Model, the government together with other stakeholders in the joint venture will earn about N2.98Billion. This is based on the fact that the 10,000MT of lead ore were exported at the rate of $850/MT and using an exchange rate of N350 to 1$ the total income on this export transaction will come to about N2.98Billion. If the share of the state governments in this arrangement is 40% for example, this will mean that the amount that will accrue to the coffers of the state governments will come to about N1.19Billion. To make hundreds of millions from this arrangement, all the state needs to do is to scale up production to hundreds of thousand MT and then engage technical partner to process it to ingots. This is a lot of income being lost by the state because they are only focussing on a cheaper way of generating revenue instead of doing the hard work that will lead to an enduring income stream in this sector. Finally, I want to unequivocally say that any state government in Nigeria that will embrace this model and implement them in about 3 to 5 joint venture agreements will soon become financially independent of the federal government in Nigeria. I will like to therefore call on all the state governments in Nigeria, especially those that are located in states where exportable solid mineral are found in commercial to reach out to the consultants and other relevant stakeholders in the mining industry in order to make this a reality in their various states.